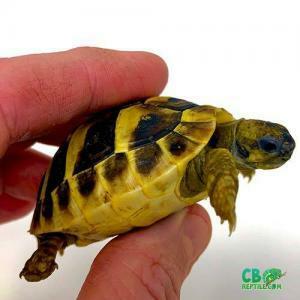 baby hermann’s tortoise for sale as well as adult eastern hermann’s tortoises for sale. Eastern Hermann’s tortoise (Testudo hermanni boettgeri) is the larger, more common of the Hermann’s tortoise for sale. Eastern Hermann’s tortoises for sale are a bit more dull in color than their Western Hermann’s tortoise cousins. Rather attractively colored specimens are not unheard of. 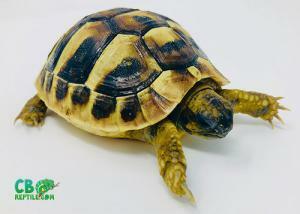 In fact, we maintain some striking eastern hermann’s tortoises for sale ourselves. The ground color of the carapace is typically a horn color or can be brown, yellowish, or ochre. Less intense black or dark brown bars and blotches border it. The 5th vertebral scute usually lacks the keyhole symbol but a less defined “version” of it can found in some specimens especially captive bred juveniles. 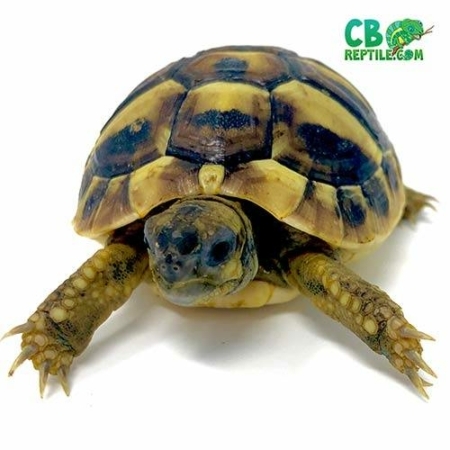 The Hermann’s tortoise head is bulkier with the eyes situated higher up and the yellow spot or fleck under each eye is usually absent except in neonates. Skin color is usually dark and may be tan, brown or grey. 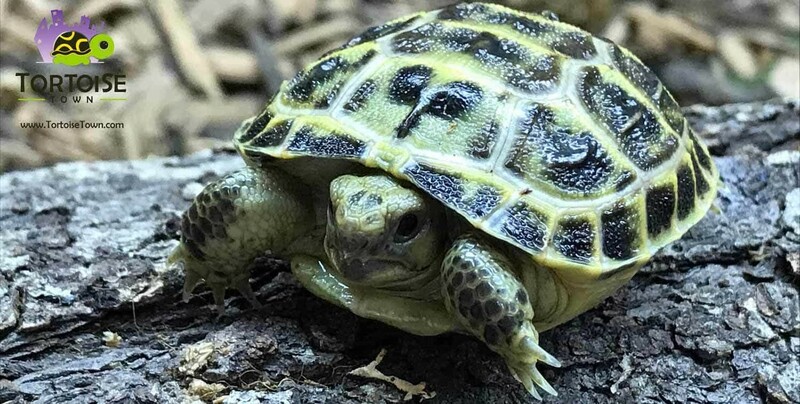 An Eastern Hermann’s tortoise for sale plastron exhibits discontinuous black markings which appear faded, broken up and nowhere near as well defined or prominent as in their western cousins. However, an almost entirely black plastron is sometimes found in specimens deriving from southern Greece. The space between the pectoral scutes is usually longer than that of the femorals or they may be an even length in various cases. Females Eastern Hermann’s tortoises typically reach seven to eight inches. However, extremely large, ten inch plus females have been encountered in parts of the world such as Bulgaria and also in captive collections. Males usually do not surpass seven inches but larger animals are not unheard of. Hermann’s tortoises have a flatter, broader look and are more elongate than round.